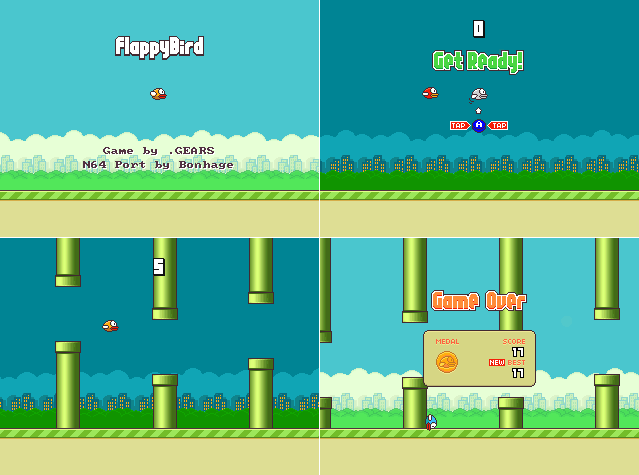 Christopher Bonhage made a Flappy Bird for Nintendo 64 about eight months ago. If you like this very well hyped game, get out your Nintendo 64 now. The ROM file has been tested to work on real Nintendo 64 hardware using a EverDrive-64. It should also work with 64drive by retroactive. The game is open source and released under a BSD license. 40 Winks is a Nintendo 64 platformer that was cancelled back in 1998 by publisher GT Interactive. Now is ready to release officially by Piko Interactive. IIn 1998 GT Interactive commissioned Eurocom to create a game. This game was 40 Winks, also known as Ruff and Tumble in Europe. However, in 1999, due to a slew of bad decisions by GT Interactive, the company lost millions of dollars of revenue. These financial troubles plagued GT Interactive throughout the following two years. To stay afloat, GT Interactive began downsizing operations and selling popular game franchises. Eventually the financial strain became too much, and they were acquired by Infogrames. The Infogrames acquisition brought with it shakeups within GT Interactive including, but not limited to, cancelling projects and pressing the “kill” button on other games that were in development. While 40 Winks was able to see release on the original PlayStation console, the Nintendo 64 port, which was under development around the time Infogrames became involved, was not as lucky. The N64 version of 40 Winks was cancelled and until recently thought to be lost to history and time itself. Nearly 17 years later Piko Interactive have pulled 40 Winks out of limbo and plan to give it a fair chance to shine on the Nintendo 64. Some of the adventures ScummVM supports include Adventure Soft’s Simon the Sorcerer 1 and 2; Revolution’s Beneath A Steel Sky, Broken Sword 1 and Broken Sword 2; Flight of the Amazon Queen; Wyrmkeep’s Inherit the Earth; Coktel Vision’s Gobliiins; Westwood Studios’ The Legend of Kyrandia and games based on LucasArts’ SCUMM (Script Creation Utility for Maniac Mansion) system such as Monkey Island, Day of the Tentacle, Sam and Max and more. You can find a thorough list with details on which games are supported and how well on the compatibility page. ScummVM is continually improving, so check back often. – Added support for 3 Skulls of the Toltecs. – Added support for Eye of the Beholder. – Added support for Eye of the Beholder II: The Legend of Darkmoon. – Added support for Hopkins FBI. – Added support for Tony Tough and the Night of Roasted Moths. – Added support for The Journeyman Project: Pegasus Prime. – Added support for the Macintosh version of Discworld 1. – Added a new save/load chooser based on a grid of thumbnails. This is only supported for resolutions bigger than 640×400. The old chooser is still available and used for games without thumbnail support. It is possible to select the old one as default too. – Using the mouse wheel on a slider widget now changes the value by the smallest possible amount. This is more predictable than the old behaviour, which was to change the value by “one pixel” which would sometimes not change it at all. – Updated MT-32 emulation code to latest munt project snapshot. – Added FluidSynth settings dialog, mainly for reverb and chorus settings. – Fixed crash on certain Smacker movies. – Improved audio support for Amiga and AtariST versions of Future Wars. Now music fades out slowly instead of stopping immediately. Sound effects are now properly panned, when requested by the game. – Soltys contains a puzzle requiring the ALT key to be pressed while clicking on an object. This puzzle has been disabled on devices not using this key. – Resolved multiple UI issues with the original save/load screen. – Added advanced savegame functionality, including savegame timestamps and thumbnails and the ability to load and delete savegames from the launcher. It’s now possible to use the ScummvM save/load dialogs. – The F7 key (previously unmapped) now always shows the ScummVM load screen. The F10 key displays either the original save/load screen, or the ScummVM save screen, if the user has selected to use the ScummVM save/load dialogs. – Now that the game is freeware, there is a small extra help text showing the available commands in the in-game terminals when the player uses the ‘help’ command. Previously, players needed to consult the manual for the available commands. Since this reference to the manual is a form of copy protection, this extra line can be toggled by the ScummVM copy protection command line option. – Simplified the movie speed options, and added a custom option for The 7th Guest. Movie options are now “normal” and “fast”, with the latter changing the movie speed in T7G to match the faster movie speed of the iOS version. The game entry might need to be readded in the launcher for the new setting to appear. – Added music support for the Macintosh version of I Have No Mouth and, I Must Scream. – Implemented Monkey Island 2 Macintosh’s audio driver. Now we properly support its sample based audio output. The same output is also used for the m68k Macintosh version of Indiana Jones and the Fate of Atlantis. – Improved music support for the Macintosh version of Monkey Island 1. It now uses the original instruments, rather than approximating them with General MIDI instruments, and should sound a lot closer to the original. – Added sound and music support for the Macintosh version of Loom. – Handle double-clicking in the Macintosh version of Loom. – Major bugfixes in INSANE (the Full Throttle bike fights). – Added support for Enhanced Music by James Woodcock (http://www.jameswoodcock.co.uk/category/scummvm-music-enhancement-project/). – Added support for Lands of Lore: The Throne of Chaos. – Added support for Blue’s Birthday Adventure. – Added support for Ringworld: Revenge Of The Patriarch. – Added support for the Amiga version of Conquests of the Longbow. – Added PlayStation 3 port. – Fixed the ARM assembly routine for reverse stereo audio. – Added support for building with MacPorts out of the box. – Implemented sound support for the DOS version of Winnie the Pooh in the Hundred Acre Wood. – Implemented support for loading data directly from InstallShield cabinets in The Feeble Files and Simon the Sorcerer’s Puzzle Pack. – Fixed loading and saving in the PC version of Waxworks. – Fixed music in the PC versions of Elvira 1/2 and Waxworks. – Added support for the iOS version of The 7th Guest. – Fixed crash when trying to talk and ask something at the same time. – Added better handling of digital vs. synthesized sound effects. If the “Mixed Adlib / MIDI mode” checkbox is checked, the engine will prefer digital sound effects, otherwise their synthesized counterparts will be preferred instead, if both versions of the same effect exist. – Implemented PC Speaker support for SCUMM v5 games. – Fixed priority bug in iMuse. As a result the AdLib music should sound better, since important notes are not interrupted anymore. – Implemented CMS support for Loom, The Secret of Monkey Island and Indiana Jones and the Last Crusade. – Improved palette handling for the Amiga version of Indiana Jones and the Fate of Atlantis. – Fix freeze in Windows demo. – Fix crash when using cutscene subtitles pack with the Macintosh version. – Fixed deleting saved games from the list of saved games (from the launcher and the in-game ScummVM menu). – The US version of Discworld II now shows the correct title screen and language flag. – Fixed plugins on Android 3.x. – Moved the default saved game location to the SD card. and was made without using the official SDK. – Improved audio device detection and fallback. There should be no more silent errors due to invalid audio devices. Instead ScummVM should pick up a suitable alternative device. – Added detection entries for more variants of some Living Books games. – Fixed a regression that made Discworld uncompletable. – Fixed a regression in Inherit the Earth’s dragon walk code which was causing crashes there. – Fixed a regression causing various crashes in I Have No Mouth and I Must Scream. – Added detection entries for some Macintosh game versions. – Audio settings are now stored correctly for the CD version of EcoQuest 1. – Fixed graphics bug in FM-TOWNS versions of games on ARM devices (Android, iPhone, etc.). – Added support for Backyard Baseball. – Added support for Backyard Baseball 2001. – Added support for Urban Runner. – Added support for Playtoons: Bambou le Sauveur de la Jungle. – Added support for Toonstruck. – Added support for Living Books v1 and v2 games. – Added support for Hugo’s House of Horrors, Hugo 2: Whodunit? and Hugo 3: Jungle of Doom. – Added support for Amiga SCI games (except Conquests of the Longbow). – Added support for Macintosh SCI1 games. – Added support for loadable modules on platforms without a dynamic loader (GSoC Task). – Added Norwegian Bokmaal translation. – Added Norwegian Nynorsk translation. – Added Debug Console to Cine, Draci, Gob, MADE, Sword1, Touche and Tucker Engines. – Closed significant memory leaks. RTL should now be more usable. – Closed memory leaks in Simon 2 and Feeble Files. – Corrected memory leaks and invalid memory accesses. Future Wars should be more stable. – Made Operation Stealth completable, though significant graphical glitches remain so not official supported. – Added German and French subtitles in the Von Braun cutscene (#3069981: no subtitles in scene with “von Braun”). – Improved French translation of the game. – Added support for “Return To Launcher”. – Fixed “Goblin Stuck On Reload” bugs affecting Gobliiins. – Corrected issue which could cause crash at engine exit. – Closed memory leaks in Nippon Safes Amiga. – Added a CMS music driver for SCI1 – SCI1.1 games. – Added an option to toggle undithering from the ScummVM GUI. – Added several previously missing parts of the game state in saved games, such as game played time, script created windows, the script string heap and information related to the text parser in old EGA games. – Added support for SCI1.1 magnifier cursors. – Added support for the keypad +/- keys. – Added support for the alternative General MIDI tracks in the Windows CD versions of Eco Quest, Jones in the Fast Lane, King’s Quest 5 and Space Quest 4. – Added support for the alternative Windows cursors in the Windows version of King’s Quest 6. – Added support for simultaneous speech and subtitles in the CD versions of Space Quest 4 and Freddy Pharkas. – Corrected resource loading leaks. – Corrected several problems and issues in the Skate-O-Rama rooms in Space Quest 4. – Corrected several issues in Hoyle Classic Card Games. – Fixed several graphical glitches (like, for example, parts of the screen that weren’t erased correctly under some rare circumstances). – Fixed several script bugs. – Fixed several pathfinding related issues and lockups (like, for example, a lockup in the shower scene of Laura bow 1 and pathfinding in some screens during the chase sequence in Laura Bow 2). – Fixed several music related glitches and possible lockups (like, for example, a rare music lockup that occurred when loading a saved game outside the palace in Quest for Glory 3). – Fixed possible problems and lockups in the character import screens of Quest for Glory 2 and 3. – Fixed a bug that caused a lockup in the SCI1 CD version of Mixed Up Mother Goose, after Tommy Tucker’s song. – Fixed a script bug in the CD version of King’s Quest 5, which caused a lockup under certain circumstances when going outside the witch’s house in the dark forest. – Function keys now work correctly when the num lock key is on. – Improved support for fanmade game scripts. – Improved support for non-English versions of games. – Made several enhancements and fixes related to MT-32 music (e.g. reverb). – Music is no longer out of tune when loading saved games. – Improved support for FM-TOWNS versions of games. – Fixed crashes on sequences for several ports (Android, OpenGL, …). – Closed memory leaks in Coroutines. – Added enhanced music support for the German CD “Neon Edition” re-release of Discworld 1. – Corrected memory leaks and minor issues. – Added workarounds for several issues present in the original game. – Closed memory leaks in Mouse Surfaces. – Switched to the official NDK toolchain for building. – Fixed GFX output for various devices. – Switched to the native screen resolution to improve text readability. – Added support for pause/resume. – Added support for games using 16bit graphics. – Increased the performance significantly. – Added support for the “Fullscreen mode” option. Unchecking this keeps the game’s aspect ratio. – Added a new graphics mode for linear filtering. – Overhauled the input system (see README.Android). – Added a MIDI driver based on SONiVOX’s Embedded Audio Synthesis (EAS). – Added support for loadable modules. – Fixed 16bit mouse cursors on HE games. The last ScummVM release in this year just has been released. This is a maintenance release and is aimed to fix several important bugs since 1.2.0. Particularly we added Hungarian and Brazilian translations of the GUI, and made bugfixes to the Cruise, Groovie and Lure engines. – Add Brazilian Portuguese translation. – Fixed a regression that made the Russian version of T7G crash.